So far 2013 has been a big year for readers and technology. We’ve seen startups like Memphis’ ScrewPulp offering a new kind of self publishing platform. We saw Amazon’s Jeff Bezos add the digital download to traditional books, and now it seems everybody is talking about Oyster. E-Book reading is a huge growing market. According to a recent report from the Washington Post, e-book sales in the US topped $3 billion dollars this year. That, according to TechCrunch, accounted for a 44% increase in e-book sales. The UK saw a whopping 134% increase from 2011 to 2012. As more and more people switch to table devices or add a table device to their smart devices, e-books are becoming more and more popular. Amazon, iTunes, and others have made finding and reading books so easy that you don’t even have to set foot in a library or bookstore. Eric Stromberg, Andrew Brown, and Willem Van Lancker are preparing to disrupt the e-book market again by offering a Netflix style “book renting” platform. Their startup, Oyster, lets the user download/rent unlimited e-books for $9.99 a month. Oyster already has over 100,000 titles in their library and has scored partnerships with some big publishers in the world including Harper Collins, Houghton Mifflin, Worman, Rosetta Books and more. In addition to its first to market rental platform for books, Oyster has also deployed a social layer on top of their reading platform so that users can share and stay updated with their friends on what they are reading. With most e-book downloads ranging from $9.99 to $14.99 for one book, any one who reads should check out Oyster and get on their waiting list. Hospital Acquired Infections, or HAIs, are a very serious problem and very serious business. Over 100,000 people in the U.S. die every year from infections they acquire once they are admitted to the hospital. The biggest culprit in the passing of infections in the hospital is improper hand washing. While it’s such a critical part of patient care, doctors, nurses, techs, volunteers, and other hospital caregivers either skip hand washing all together or quickly run their hands through water without washing them thoroughly. IntelligentM is trying to fix that problem using sensors. The Sarasota startup has been through the BluePrint Health accelerator in New York, the GE Startup Health program, and the SXSW accelerator program. The sensors, actually in this case RfiD tags, are embedded in a bracelet that hospital care givers wear. Sensors are also installed at hand washing stations and most points where a caregiver needs to administer care. The water safe bracelet, similar in size and material to a “Live Strong” bracelet, communicates with the sensors on the hand washing stations. The bracelet can tell how long it’s been at the hand washing station. They emit a buzz or vibration that tells the caregiver to wash their hands and gives a shorter signal when hands have been washed. 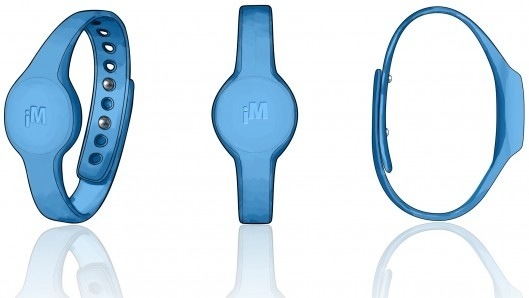 The bracelet also has a microUSB connection that can output historical hand washing information for hospital administrators. With the introduction of “ObamaCare” HAIs became an even bigger focus area. Hospitals will now have their infection scores posted publicly, and infection rates will play into reimbursement rates for hospitals. The IntelligentM has been testing at a Sarasota hospital since last year. 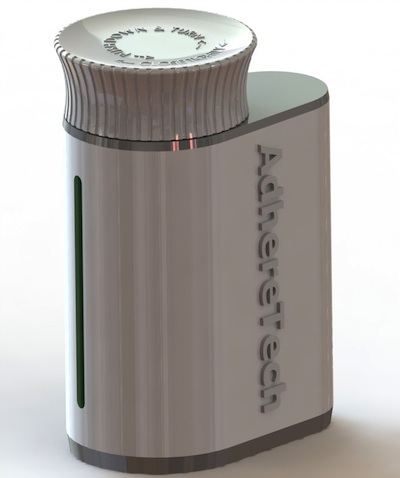 A New York startup called AdhereTech has created a sensor laden pill bottle. The bottle looks just about the same as a regular pill bottle, with a little extra girth for both the sensor and a 3g radio chip. When the 3g radio chip is coupled with the sensors in the pill bottle it can provide information on dosage timing, how many pills are in the bottle and if the bottle is being opened and closed at the correct times. The ability to communicate this data to a care provider and also to a health management app can be game-changing to people dependent on taking lots of medication. We talked with the team at AdhereTech about taking multiple prescriptions,and multiple bottles in the same home will not cause any kind of conflict. We got to interview them at TechCrunch Disrupt NYC 2013. They are also going to participate in the AARP/Live Pitch 2013 Health Innovation Conference in Las Vegas. Out of 100s of applications, AdhereTech was chosen as one of 10 to pitch their product on the main stage. They aren’t the first health startup to add sensors to products patients use everyday. At CES 2013 earlier this year we met the team from Geckocap that has installed sensors on asthma inhalers which help track children’s albuterol treatments and gamifies the use of the inhaler for young patients to insure they take their inhaler medication. Check out the video below and for more information visit adheretech.com. Have you seen these startup stories from TechCrunch Disrupt NY 2013? You may think that today is all about accelerators and healthcare, well we didn’t intend it to be that way but there’s major startup news on the accelerator and healthcare front. DreamIt Ventures, the multi-city startup accelerator brand, announced late last year that they would be teaming up with Independence Blue Shield and Penn Medicine to hold their first medical focused startup cohort. They announced that cohort on Wednesday. For the first DreamIt Health accelerator they put out an application call for startups seeking to develop tools for healthcare providers to speed up diagnoses and improve outcomes. “At IBC, we believe that innovation is the key to bringing fresh ideas into health care, and are working to transform the Philadelphia region into a national magnet for health care innovation, investment, and employment,” said IBC CEO Daniel Hilferty in a company statement. The first cohort includes big data startups, mobile startups, devices, and even fitness startups aimed at curbing childhood obesity. Each team will receive what MedCityNews called a “stipend” of $50,000 and of course access to the DreamIt, IBC and Penn Medicine entrepreneur and mentor network. The program will end with an investor demo day showing the progress these early stage teams made in the program. AirCare: A mobile startup to help hospitals prevent readmissions and improve patient outcomes using telenursing and patient-specific analytics. Biomeme: A mobile molecular diagnostics device to help point-of-care clinicians and epidemiologists diagnose and track infectious diseases in realtime with smartphones. Fitly: The company wants tohelp health plans deal with the childhood obesity epidemic by engaging and motivating at-risk families with gaming and convenient delivery of healthcare. Grand Round Table: Its application helps clinicians rapidly diagnose complex cases by matching the patient’s electronic record against millions of other cases drawn from around the world. Medlio: The mobile app aims to help physicians get paid faster and get rid of paper-based registering forms with a virtual health insurance ID card to sync the right information among patients, providers and payers at the point-of-care. OnShift: Helping hospitals improve patient outcomes through instant communications between clinicians caring for the same patient is the goal of this healthcare communications system. It also wants to remove obstacles to effective care delivery and care transitions. Osmosis: The learning management system helps medical institutions develop clinicians who better retain and apply knowledge through a Web and mobile platform that uses cutting-edge cognitive techniques. MemberRx: A solution intended to improve the way pharmaceutical costs are controlled by enabling selection of the best generic or on-formulary branded drug for a specific patient through an electronic medical record system. SpeSo Health: The online analytics platform identifies and accesses medical expertise in rare and complex diseases. Stat: The Web and mobile app helps providers and payers make patient transport more efficient and lower costs by matching and dispatching idle transportation resources. The application deadline for Memphis’ highly successful ZeroTo510 medical device accelerator is tomorrow. There are some incredible startups coming out of Memphis Tennessee and HandMinder is one of them. Handminder was part of the first class at the ZeroTo510 accelerator. Zeroto510 is the first cohort based medical device accelerator and was a joint venture between Memphis BioWorks and Seed Hatchery, the local tech startup accelerator. HandMinder was founded by Dr. Yu Liu, MD,Phd, Randall J Nelson PhD,John M Denton, Technical Advisor & CoFounder, James Bell who currently serves as the company’s CEO. A shocking 15 million people suffer from strokes across the globe. 12.5 million of those people survive and of those 12.5 million, 60% of them have some form of hand dysfunction after the stroke. The devices that are currently on the market today that help rehab stroke victims’ hands deal with the problem from a total physiological perspective. The devices today allow functionality but not learned functionality. They provide localized muscular exercise but not brain function. The HandMinder device, which fits like a glove, restores the neurological connection between the hand and the brain. The loss of hand movement in a stroke victim is a neurological problem, not just a physiological problem. By reprogramming the stroke victims brain to hand function, HandMinder closes the natural physiological loop. Unlike other devices that address this issue, HandMinder is a take home product that allows stroke victims to rehabilitate their hands as often as they would like without having to take up extra time in their rehab clinics. It also allows them to continue their therapy while traveling, being outside and living somewhat normal lives. When designing the HandMinder product, the team at HandMinder talked with stroke victims and their families. Because strokes are more prevalent in older patients, Handminder even talked with grandparents and grandchildren who were concerned with the way some of the medical devices looked. A lot of other devices used for this purpose, seemed somewhat scary to grandchildren which was a real concern for older patients. Handminder, while still a medical device, “looks cool”. HandMinder presented at the ZeroTo510 demo day last month to a crowd of investors. They are currently working on their third prototype and plan to start field testing the device shortly. No one covers high growth startups in the SouthEast like nibletz, more here. There may be some great news for parents of Autistic boys in the coming years. 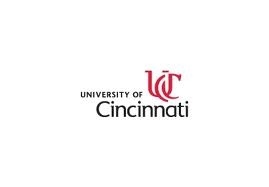 A research team at the University of Cincinnati has announced that they’ve successfully treated an animal model of Creatine Transporter Deficiency (CTD). CTD is what causes Autism in boys. Over 50,000 boys in the US are afflicted with CTD. Creatine Transporter Deficiency causes symptoms including seizures, mental retardation and speech defects. CTD was discovered at Children’s Hospital in Cincinnati in 2000. Almost all of the research on CTD has been performed at Children’s Hospital and at the University of Cincinnati. The research team found that cyclocreatine, which has been dubbed CincY, has been incredibly effective at reducing the symptoms of CTD models in animals. Clark reported that the time from discovery in 2000 to the discovery of this possible treatment in just twelve years was actually a rather short time frame. While this work has been done on animals, it may be another two to three years befor CincY can be used to treat humans. Clark is quick to point out that this is just a treatment for the disease and not a cure. “Essentially, a cure is fixing a broken pipe at the break, and a treatment is making a bypass around the afflicted area without fixing it, but in a manner that eliminates the symptoms” Clark said. Just prior to the StartupRockon kickoff part at the Democratic National Convention in Charlotte North Carolina we got to meet Amir Khoshnevis the Chief Strategist for Charlotte startup WeRx.org. They were one of the three finalists for the $5,000 StartupRockon grant contest. The winner was announced just before The Roots took the stage. WeRx.org is an innovative crowdsourcing platform that would definitely be considered in the social entrepreneurship space. Khoshnevis and his co-founders discovered that people are paying way too much for their medication. Of course we’ve known this for years but what the WeRx team found was something that will blow most people’s minds away. Take Lipitor for example. In it’s generic form the WeRX team found some pharmacies sold the drug for $11 and on the high end, $180 and that’s right in the Charlotte metro area. The unfortunate reality is that most people who require medication may do a limited cost comparison, and if they do they check the few pharmacies close by. If they can’t afford the cost of the medication close by they often decide to not take it. This can ultimately lead to death. As another example Khoshnevis and the WeRx team found that in West Charlotte diabetes medications cost two to three times as much as they do in the Ballentine suburb of Charlotte. Why? Because the demographics skew more diabetic in West Charlotte. So what did they do about this problem? They created WeRx which is a platform that allows people to crowdsource prescription prices. WeRx encourages those taking medications to input what they paid for it. Then then end users can geo-discover the best prescription prices and make the trip to another pharmacy to get the best price. Ultimately the idea is to build such a large platform that big pharmacy companies bring their pricing system back inline with each other. WeRx gives those that report prices a feel good “pill heart” so they know they’ve done their part to help people find the medications they need and hopefully drive the cost of prescriptions down. This idea was so good that the startup that launched just last week, won the $5,000 StartupRockon grant contest. There win was announced Monday evening at the StartupRockon party featuring The Roots. Nibletz is the voice of startups “everywhere else” and we’re on a sneaker strapped road trip “everywhere else” more info here. Providing people with the tools they need to find appropriate care everywhere saves everyone, hospitals and patients, money and time. Patients receive a SMS from triage.me post emergency room discharge. By sending a text to triage.me with their problem and current address, we route the person towards the nearest clinic, providing the address and a link to directions (for smartphone users). Many clinics that work with the underinsured also often have variable hours and locations. We’ve made it easy for these clinics to update their hours and location via SMS so that we can better route triage.me users to locations. This is a huge issue that faces the current health care system, the CDC (Centers for Disease Control and Prevention) estimates that 50% of the 121 million emergency room visits in 2011 could have been handled in a primary care situation. The typical emergency room visit costs an average of $700 versus $150 for a primary care physician possibly reducing costs by $550. Blog post 2…We’re now full steam ahead on triage.me and have some exciting things in store. Exactly 50 days after conceptual, triage.me will launch on June 5 for public use in Milwaukee and DC. We’ve started mapping out ways to expand triage.me to make it even better. Blog post 3…So, we had 4 weeks to design a booth and rewrite an entire product. Oh, and Mark was already committed to working 30 hours a week in Chicago. We called in whatever favors we could muster and got some wonderful help from Abby Larner reworking the front-end design. Aurora stepped in to help with the booth and drove one of their display boards across the city so we could pick it up. Where are we now? Mark and I are fully committed to building triage.me into the platform we know it can be. We’ve received a lot of positive feedback and guidance over the last few weeks and there ia a lot of thanks due. Stay tuned, this ride’s just getting started! Triage.me was presented at the Health Datapalooza (video below). Descriptions of both BuildHealth and HDI can be found below. triage.me [Moxe Health] from HDI Forum on Vimeo. BuildHealth is a context design for enabling collaborative conversation, engagement and accountability around the idea of good health. Our definition of health is holistic: it is being physically, mentally, emotionally, economically, environmentally and socially balanced. With such a broad definition, the mission is currently focused on the Greater Milwaukee area in order to be effective. The core functions of the BuildHealth organization are facilitation and community alignment. Our intent is to avoid duplication of services, to overcome silo-ing and territorialization and to empower community at its most basic level. We believe each community already has what is needs to become accountable for its state of health. The Health Data Initiative Forum III: The Health Datapalooza was held June 5 and 6, 2012, at the Walter E. Washington Convention Center in Washington, D.C. The event brought together a diverse group of more than 1,500 data experts, technology developers, entrepreneurs, policy makers, health care system leaders, and community advocates to support innovative applications of health and health care data. A Kansas City startup called Cognovant launches last summer and has been working on a new, easy to use mPHR (mobile personal health record) application. Their application, called PocketHealth, is actually a suite of applications and is cross platform. The company has been saying for months that they will be launching on iOS and Android this month. With the news that they just raised a $500,000 seed round, they should be that much closer to reaching their deadline. Cognovant’s PocketHealth, will be free for individual users to download and use. The app captures data and allows users to manage their wellness. It’s built under the stringent medical industry standards. Cognovant has said that the application is based on international data standards and has the same foundation as a full electronic medical record. Cognovant CEO, Dr. Joe Ketcherside, confirmed to SiliconPrairie today that they are still on track for a launch in about two weeks after final testing is complete. Beyond the base, free app, users will be able to download a multi-user “family” version which will give users the ability to manage multiple health records. They will also have an upgrade called PocketHealth PHR which will allow users to manage more complex health issues. An Atlanta startup in the healthcare industry that just launched this month, demonstrated their web app that connects patients with real, legitimate coupons for their medications. Kishore Eechambadi, Co-Founder of MyCouponDoc has built the startup to battle the increasing cost of co-pays for medication. According to Eechambadi co-pays have doubled in the last 10 years. According to the Wall Street Journal the costs of co-pays will continue to increase 15% annually. MyCouponDoc has already been accepted into the Healthbox Accelerator Program that provided them with $50,000 in seed funding. They’ve sourced over 400 coupons on the most popular prescription and over the counter medications. According to Eechambadi mycopondoc.com’s coupons are accepted at pharmacies and doctors offices. MyCouponDoc also plans to roll out their technology to 500 pharmacies across the country so that the coupons are available at point of sale. They’re also partnering with a major EMR (Electronic Medical Record) service provider that will help integrate their sourced coupons in the doctors office at the time of prescription. This would give those doctors the option to recommend a prescription knowing the coupon is there and tell the patient about the discount during the exam. The managing partner and co-founder of Think Big Partners, Herb Sih, has launched a new startup of his own called “Startup Your Fitness”. The new media startup (blog) aims at giving startup founders and entrepreneurs who live the workaholic startup lifestyle fitness and living tips that fit into their busy lives. The site, which launched on the first of April, was no April Fool’s joke. “Startup Your Fitness” offers exercise tips, diet tricks and health advice that can fit into a busy lifestyle. Sih created the startup because as a serial entrepreneur he found himself drifting further and further away from being in shape. Austin based pharmatech startup RxNetwork has officially launched their consumer facing website designed to help people find the best possible prices on prescription drugs in their area. The site serves up both online and brick & mortar pharmacies by zipcode. All you have to do is enter the prescription name, choose the right dosage and enter your zipcode. 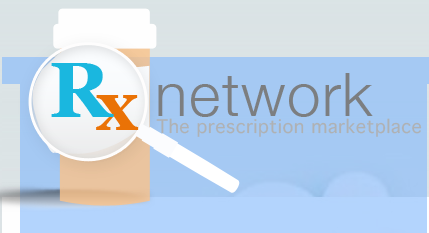 Once that information is entered RxNetwork searches local pharmacies whether they be stand alone or in big department stores like WalMart and Target, to find the best possible price for your prescription. Where applicable it also shows you the availability of a generic version of that particular prescription and the cost. The first thing we thought when we heard about Ova Ova is that the fertility space is extremely crowded. One quick look in both the Google Play Store and the iTunes App Store revealed hundreds of apps for tracking fertility, and this couple still isn’t mobile, however they are putting a different spin on fertility tracking. Omaha, Nebraska based Ova Ova was founded by 24-year-old Amanda Kohler and her husband Kevin. 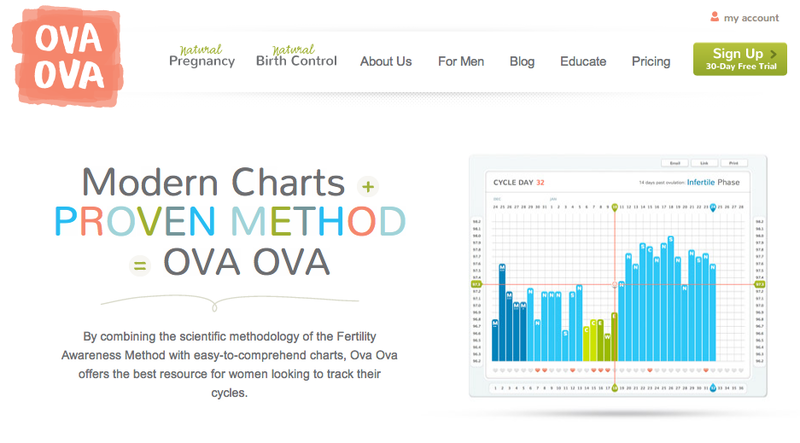 They set out to take fertility tracking sites out of the 80’s with their spreadsheets and line graphs and make the process a lot more aesthetically pleasing. The Kohler’s felt that other sites on the market now were not up to date with technology. In an interview with SiliconPrairie Kohler said she had always wanted to start her own business but it wasn’t until an awkward encounter with a cattle rancher on an airplane that gave her the idea for Ova Ova. Kohler told Silicon Prairie that she was on a plane and asking the rancher if he used anything organic on his ranch. He said he didn’t. He then turned to her and asked if she used birth control. The rancher made the point that taking birth control and ingesting synthetic hormones daily was on a much more direct scale than eating commercially raised beef. This story has been making it’s way around the interwebs. It’s been vetted now, a number of times and while this may seem like something out of a movie, Hangover Heaven is very real. 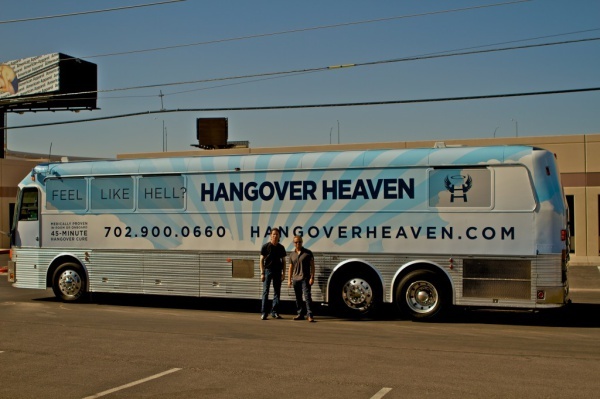 A Las Vegas anesthesiologist, Jason Burke, came up with the idea for Hangover Heaven after realizing that most of the effects of a “hangover” are things that he regularly sees in a recovery room after surgery. Burke decided that he could use mild doses of the drugs used to revive patients after surgery to get people back on their feet after a night of card playing and binge drinking. 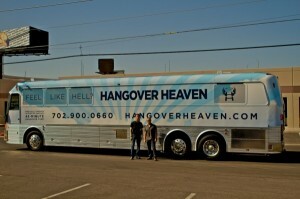 Hangover Heaven has a fleet of IV equipped buses that will be strategically placed throughout Las Vegas’ infamous strip. They’ve already been approved for pickups at The Cosmpolitan, Hard Rock Hotel, The Paris and The Bellagio. After you’ve been drinking and you need a little pick me up, simply board the bus and fork over Dr. Burke’s fee. There are three different plans available; the Redemption, Salvation and then In Room Treatment. The latter will set you back just $500 for the first person and $375 for each of your other drunk buddies. They are discounting the Salvation package to an introductory price of just $150.